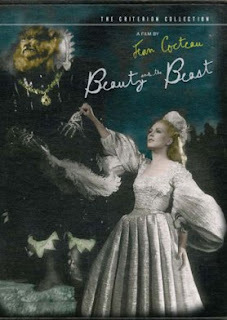 Jean Cocteau's Beauty and the Beast is a hard film to like. I've seen it before but that was two decades ago when I was enamoured of Wings of Desire, a film whose cinematographer worked on the Cocteau film. While there are certainly films I never get sick of, I'm not sure that this is still one of them. However, I should admit with a bit of sadness that, while I thought it was firmly in my permanent Top 10 in 1988, Cocteau's film now is more a thing to be admired than enjoyed. Sorry. I will turn in my film snob pass at the door. That's not to say that some parts of the film don't still thrill me, sometimes on multiple levels simultaneously; it's the rare film that works on one's imagination, intellect, and emotions equally. My interest in the material goes all the way back to my childhood and King Kong (1933). That film, obviously, both literally and thematically quotes the Beauty and the Beast fairytale. Additionally, as a child of about 5 or 6, I had this weird little record player with a slideshow device -- like a TV -- built-in below the turntable. You would play a record with a storybook and a filmstrip and when a bell "dinged" between sections of the story being read on the record, you turned your page and advanced the filmstrip one more frame in the turntable-thing. The only story I remember using on that contraption was a version of Beauty and the Beast. Then, I had a film book about Kong and other ape movies and that had photos from the film in it, despite the fact that the beast is more cat-like than ape-like. 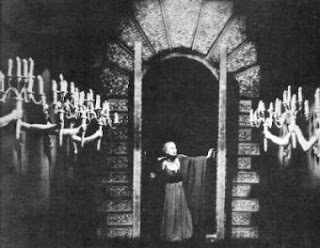 The arm-candelabras image stuck with me at that age having seen that picture in the book. And a local PBS TV station that used to show foreign films during the weekdays when I was a bit older -- where I first saw The 400 Blows when I was 13 -- used imagery of the Beast from Cocteau's film in their title sequence (the majority of the films shown on this channel in this series were also from the Janus collection which morphed into the Criterion Collection on laserdisc and then DVD). And, obviously, for any man blessed with less than good looks, the story hits close to home. It seemed even as a fat child, I could see the beautiful people with me the "beast" observing them. But, it wasn't until I was a 20-year-old, roughly, that I was again drawn to the story, this time Cocteau's 1946 version, due to the music of Bill Nelson. Nelson, former frontman of Be-Bop Deluxe, not only named his solo record label after Cocteau, but he composed his own score to the film that I used to play quite a bit. The film seemed a wonderful thing when I first viewed it on an old VHS videotape 20 years ago. Now, having watched it on a 44-inch television set on a Criterion Collection DVD, I find myself a tiny bit disappointed. Is it a case of me growing out of the film? The film, to its credit, is played completely seriously and doesn't have the tone of a film meant for children, despite the subject matter. And some wordless sequences, like Belle's entrance into the hall, are still rapturous. It's just that the film alternates between moments of a very forced kind of theatricality -- more like mannerism than stage acting -- and moments of a surreal, dream-like quality. The 1946 film has probably never looked better, although the technique used to restore the missing frames in the film does produce a few sequences where things appear jumpy. And the film does have a few washed out sequences that -- at least on my TV -- were not as sharp as I would have imagined they should be. I did enjoy most of the extras on this DVD, especially the 30-minute TV episode from France showing the real locations of the film with interviews with a bearded Zeus-like Jean Marais. You can read more about the film here on Criterion's website.